Mirrors come in all shapes and sizes. In the new millennium, they also come in a lot of styles and for a lot of purposes. Floor mirrors in 2018 are not only a big trend – they are functional and practical for many homes and households. Basically, a floor mirror can complement the home decor and be one of the best add-ons to any minimalistic, vintage or rustic living room. Unlike the traditional attachment options, floor mirrors can also let you see yourself in the best light possible, from head to toe. Now, the types of floor mirrors go beyond anyone’s expectations. There are framed leaner mirrors, floor mirrors that are frameless or even traditional cheval mirrors. Obviously, the idea is to choose a product that will best complement your living room and pick a color that suits your taste and needs. Below, we will show you the best floor and leaner mirrors in 2018 and help you choose the perfect product for your needs. 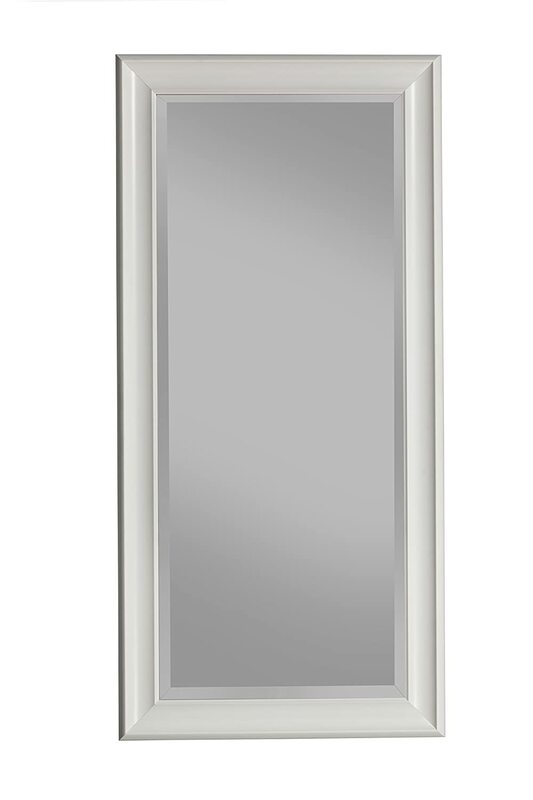 First on the list is a product by Crown Mark named ‘Cheval Mirror’ and a true bestseller online. This mirror is one of the safest choices mostly because it is designed in a simple way and can fit any living room. Plus, it is important to note that it comes in two main styles (oval and rectangular) and four main colors including Brown, Black, Cherry and Espresso. Its height with the frame is 16 ¾” x 46 ½”. The assembly is pretty easy – all you need is to attach the mirror onto the frame with the four gold screws going into the four holes underneath the bottom and use a screwdriver to tighten them. The end result is a mirror that is 59 inches high. Another great thing about this mirror is the fact that you can use it as a wall mirror too. To do that, you only need to detach it from the frame and attach it to a wall – as simple as that. 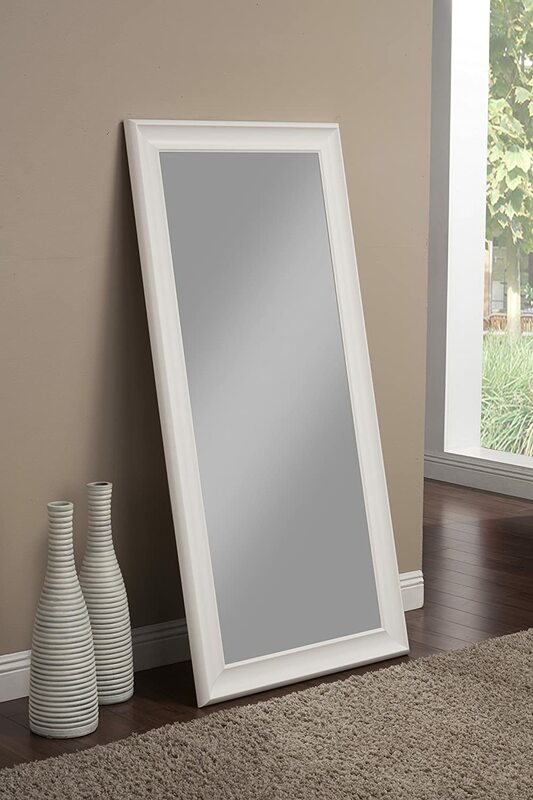 This mirror measures 36” x 30” and is a full length leaner mirror which means that all you need to do is lean it against a wall and you are ready. There is a 4 inch frame and beveled glass which can be used as a leaner mirror – but you can also mount this mirror on the wall horizontally or vertically, according to your needs. There are D-ring brackets already attached for easy wall mounting and ones that include anti-tip hardware kit for added safety. The overall dimensions of this mirror are 65” in length and 31” in width times 2” in depth. The glass dimensions, on the other hand, are 58” x 24” in length and width. You can choose from several color options including White, Black, Silver, Antique Good, Champagne Silver and Oil Rubbed Bronze. 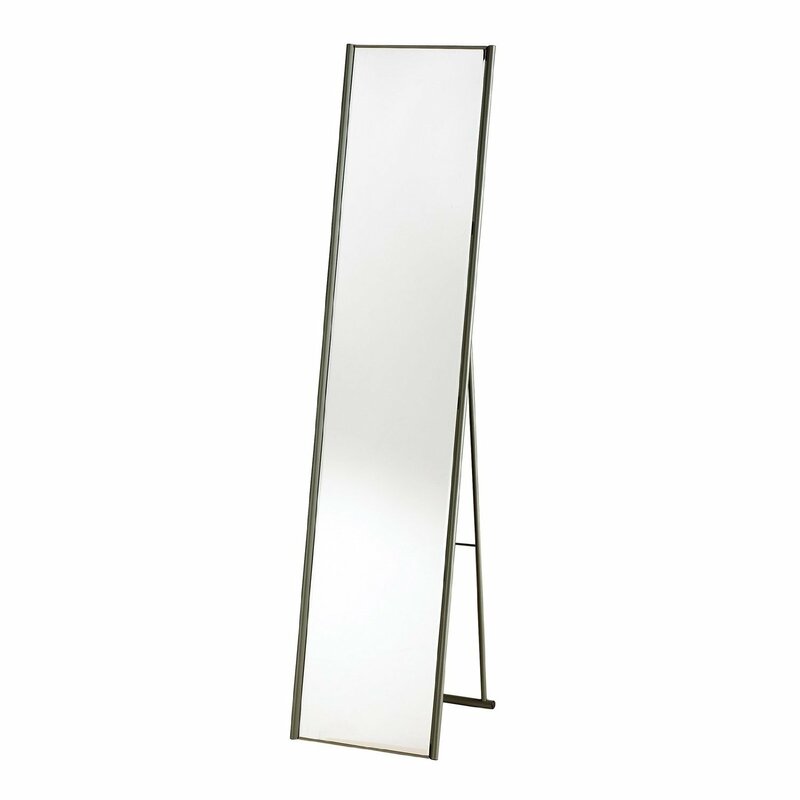 If you are after the simplest full-length leaner mirror for your home, this is one of the best floor mirrors to choose. Made of high-quality steel, it provides resistance from rust and scratches and acts as the perfect floor length mirror. The steel material has a finishing of powder coated champagne (and other color options) that offer elegance and a solid appearance. The floor mirror is light to relocate when cleaning but sturdy which makes it hard to break. Whether you want to use it in your living room or your bedroom, this mirror comes with a height of 59-inches and open depth of the looking glass that is 14 ½”. However, it can fold flat to 2-inch dept for storage purpose which is another important thing to note. If you are after a true classic, this is one of the best floor mirrors to choose from and an oval cheval mirror that comes in many colors. One of the most popular is the Cherry finish, followed by the Black, White and Oeak designs. The beautiful cheval-style mirror is perfect for traditional decor homes and tilts for full-body reflection. There is also an elongated oval glass mirror with wood frame and stand, while the freestanding designs swings it and allows perfect functionality. In other words, you can see each other from head to toe and if you need more detail, just touch the mirror to go up and down. 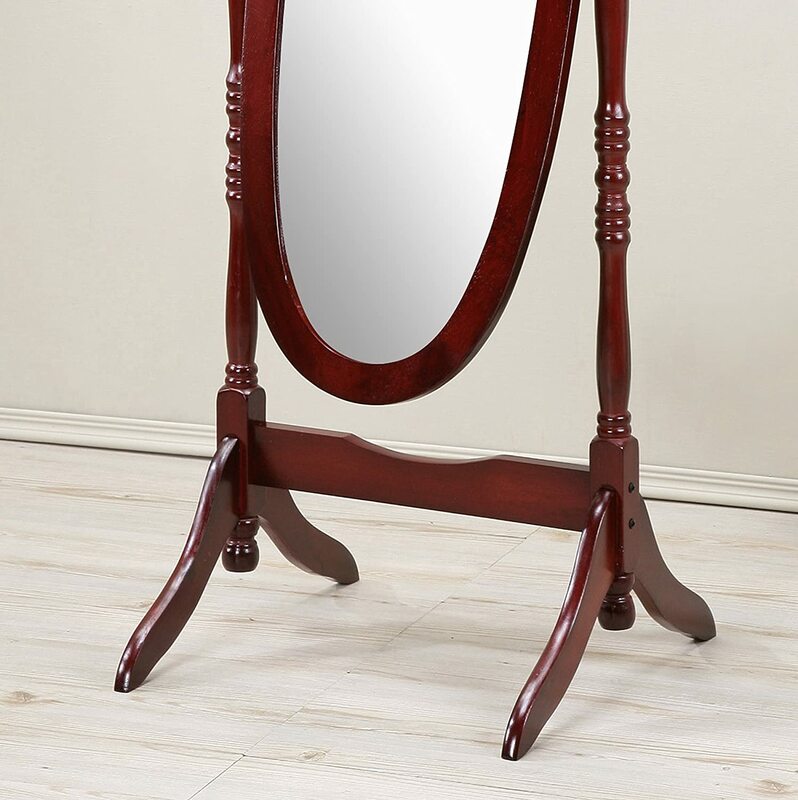 Featuring curved bracketed feet and a stretcher for stability between the legs, this mirror is 22.5” wide and 59.2” high. There is some assembly required but it’s nothing complicated. 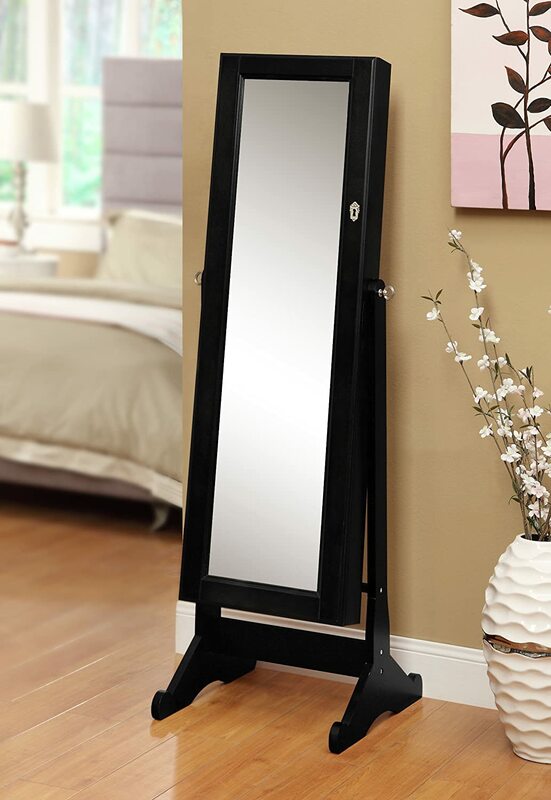 If you are looking for practical leaner mirrors or floor mirrors that offer side benefits aside from being one of your favorite accessories, this is a product to choose from. Made of wood veneer, hardwood, MDF and glass, this adjustable tilt-frame mirror fits many living rooms and solidly supports the mirror body. It is 60 inches high and 16.5 inches wide, as well as 19 inches deep. The inside Armoire dimensions are 48 inches high and 15 inches wide, which means that the mirror can be also used as an attachment separate from its stand. 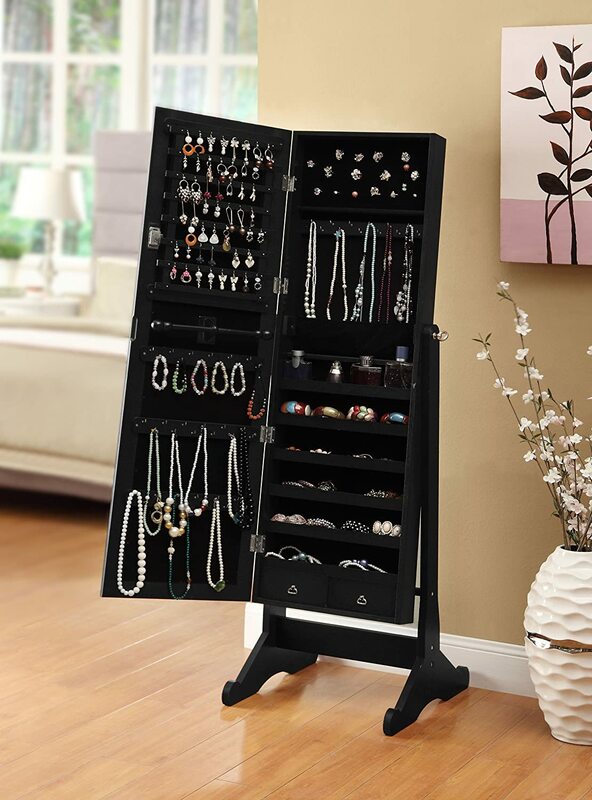 One of the best features, though, is the fact that this mirror has drawers where you can store your rings, necklaces and bracelets or any makeup accessories. This is an extra benefit that makes this model a lot more functional than the others. So, have you chosen the best floor mirror for your needs – or still thinking about it? We hope that this review helped you see the best leaner mirrors available online right now!